New Readers - Des is Lilly's occasional guest blogger and her 81 year old father. You can read his first post here. Lilly let me come back. With one proviso. That I don’t tell too many stories about her. I didn’t make any promises so I’ll see what I can get away with. I told you I was going to share my father’s Six Essentials of Life with you. If you’re looking for something deep and meaningful about loving, laughing, learning and living you are not going to find it here. You might have better luck with a fortune cookie. My father’s advice wasn’t so special but the lessons it taught me were. My father was a farmer who raised cattle, sheep and also grew wheat. He also owned a small horse stud and trained many winning racehorses and polo ponies many of which were sent to India. Shooting and riding were skills that most young men, especially those in rural areas, learned in their childhood and early teens so his advice is hardly surprising. 1. Learn to be a good horseman. 2. Have pets and look after them. 3. Always have a vegetable garden. 4. Own a pocket knife and gun and learn to use them properly. 6. Treat everyone with respect no matter who they are. Now all that sounds a bit simple doesn’t it? I think the lessons we need to learn as children are no different today. Children need to be shown how to live not just told how to live. I rode a horse from when I was a baby. 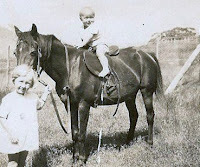 That’s me on my horse at 12 months old. You may notice I was bald. That’s why I have a good head of hair now. I was a late starter and I hope to be a slow finisher. I used to ride my horse Nabob six miles to and from school each day. I learnt not only how to ride and look after a horse but more importantly how to fall off a horse and get back up again. Sometimes we need to let our children fall and get up on their own in order to develop the resilience they need to cope with life’s ups and downs. Living on a farm, I had lots of pets. I had a pet kangaroo, lambs, calves, dogs, chickens, pigeons, cats and a goat. 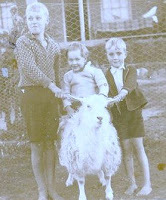 That’s me on the left with my goat Billy (no, I am not very creative, my kangaroo’s name was Joey). Animals teach us some amazing lessons - embracing change positively, unconditional acceptance, moving past fear and bringing out the best in each other. I’ve always had a vegetable garden no matter where I’ve lived. That’s a picture of me this week in my new vegetable garden. As well as the obvious benefits, which are particularly poignant in our current economic times, it’s a very healthy pastime. You get exercise by being active outdoors, it’s convenient as you can just go and pick your vegetables when you need, you know what you’re eating and the produce is significantly cheaper than buying it from a shop. I think the best lesson I learnt though is that you can bury a lot of your troubles in the dirt. Everyone needs a place to bury their troubles. When I was a child the pocket knife was the first universal tool you were given. To skin rabbits or carve cricket bats. I realise now that today schools have to confiscate guns and knives as kids come into school. Dangerous tools are both powerful and empowering at the same time. There are many more dangerous things that children get access to these days. I don’t think we should try to keep our children away from danger, thinking we can protect them. If they are available, and invariably they are drawn to it, we need to make sure they know how to handle themselves and understand the impact of danger. Sport was a very important part of my life well into my fifties. I played tennis, football and cricket. Sport teaches you to be a modest winner and a good loser. You develop a stronger sense of belonging, are more involved in the community, are less self-centred and open to learning. What I learnt was that life is not a spectator sport. It is a full contact event requiring your action and participation. We all need to give it our all. My father’s advice of being nice and respectful to others sounds like a platitude but it is the only thing to do. He taught me that people should be respected and trusted as people, not because of their position or title. Frequently, position or title did not reflect the true merits of a person. What do you think was the best advice your mother or father gave you? PS To Lilly’s Aussie readers I am off to the Melbourne Cup celebrations (biggest horse race in Australia) tomorrow and I hope you pick a winner. Hi, Congrats on be fetured blogger. Nice Blog!!! oops. Sorry not featured blogger, I just stopped by from SITS to say hi. that vegie garden looks just like the one my Pop had and reminds me of the time when he was planting strawberries and I was following behind him..pulling them all out!! anyway I'm off to get an early night...thanks for a terrific post!! How I wish my parents could have met you. (Both would have been 90 today, had they lived). Continents apart, but the thoughts going through their heads as they raised us were so similarto your fathers, particularly with respect to the connection to the greening of the earth, the immense value in good clean self nurtured veggies and flowers ( we use them for worship). And very definitely about playing sports and respect for the individual, who was true to what he did in life, no matter how small or how big it was. One thing my folks always stressed is that your work is your worship; meaning, that whatever your work vocation was, then doing it to your best ability with your best effort, was important and equivalent to the highest level of God worship. So if you were a road sweeper, you swept so well, that you were a top-class sweeper; and you were no different than , say a a top class mathematician- both strived for honest excellence. And one respected such people. This could actually be another blog . But I want to thank Lilly for introducing us to you, so we get to hear your great experiences. Please come often on Liily's blog. Welcome back, Des. I enjoyed reading how you acted on the advice your father gave you. My father had this piece of advice for me: Aim high and keep shooting. I have to admit it would be easier to do if you didn't have to keep reloading all the time. But it's advice I live by. But the best advice I ever received was the example he set. I still try to live by it. I think your an awesome man and father,,,and human being! What a great gift you have your daughter and i'm betting so many others. I wasnt blessed with good parenting..so for me-I cannot answer the question you posed. BUT...I do think all of the rules of life you posted--I try to live out and hopefully have passed on to my 5 children. I love the pet piece of this all, I have always loved animals, cant imagine my life without one. If I had some land-I'd have tons more. The garden--I will look at this differently next time I'm diggin the soil,,,I will bury my troubles. What a nice post, you are a wise man as was your father and I am sure this was all passed down to your children. You sound so much like my grandfather, I can remember him telling us kids to always look after one another. This post is awesome, God Bless. Oh, your Dad sounds awesome! All very poignant and useful. Des is also a very handsome fellow! My Dad is a babe too! Des, thanks for a great post and a wonderful reminder of what is truly important. Lily is a lovely lady that I enjoy "blogging" with and it's great to meet her Dad! Hope to meet you here on Lily's blog again soon. And, Lilly, you're a fortunate lady. Good luck to both of you at the races! I wish you were my Dad, Des! You are a very wise man full of wit and candor. Love you! Great post. I couldn't agree more with your father's Six Essentials of Life. My parents raised my brothers and I with pretty much the same advice. Now a mom myself, I have taken to heart the way I was raised. Even though in today's times it's not very popular-- my husband and I are trying to raise our boys the way we were raised. "Children need to be shown how to live not just told how to live." Parenting advice that everyone should live by! BTW you've inspired me to start my own vegetable garden. I dont know why, but this post actually caused my throat to choke up a bit. Your father sounds like such an amazing man...And I think I said that after reading his last post. But I'm saying it again. And I'll probably say it again. Simple rules...so much sense. Your father is a very smart man andn you are a very lucky daughter. BTW - I think I'm back now. Absence over. Chaos - never done, but died down a bit. Phew! What a wholesome existence you've lived and are still living. Your dad had the best advice. Nice photos. 'You can do anything you want to do' and 'You just have to pick yourself up and keep on going, regardless of what happens'. Great post. The best advice my mother ever gave me is simply to be nice. Somedays that's harder to accomplish than others. I think those rules hold true today, don't you? My biggest thought here, however, is YOU HAD A BABY KANGAROO? Frankly, I have a hard time believing that there ARE kangaroos. Silly animals! I've never seen one live; and the thought of them bounding across an open plain is just confounding. Lovely pictures. Quite handsome, aren't you? I love when you dad visits! Always such sage advice. I loved what Des said about children and danger. My mom always said, "be practical". I used to roll my eyes, but I continually find myself repeating that phrase to myself on a daily basis. Hello Des. That was an inpiring post. The simple things are the best and the least complicated. Perhaps we all get caught up in the wrong things when all is said and done. I like what you say about teaching children. I do not think we spend enough time teaching children on how to live. We teach them how to be doctors and plumbers and what not. We spend a fortune educating them but we do't teach them simple courtesies or how to survive if they have bad times. I like what you said about letting children near dangerous things but just teach them about the impact if used inappropriately. I also may start a vegetable garden do you think you could give us some tips on how. The idea of organic vegetables I have grown myself appeals. It may be harder work than going to the gocery store but how much more rewarding would it be. Hope have a little flutter on the horse race today. Des, you should write a book! I love all of your father's advice and boy could we use that now! The best advice my parent's ever gave me was "Be nice because nice matters" and "Life isn't always fair"
I know the second one sounds like a terrible thing to tell someone but it was a way my parents let us know that we were'nt entitled to anything. What a beautiful post ~ words of wisdom that can be appreciated in any generation. This year my parents planted tomatoes, cucumbers, squash, eggplant, peppers ~ some items were planted in the backyard and some were planted in the front yard. At one point, when the veggies were coming in left and right, Dad noticed how the neighbors would come over to chat and often times leave with a handfull of garden goodies. Maybe they can start a trend and have a neighborhood effort. We really should rely more on ourselves and less on the stores. Back to the basics. 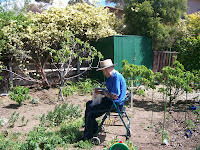 Gardening ~ It's not just good for the soul and body, it's good for the spirit of sharing too. Hello again Des, My mother always said, "what goes around, comes around in life so whatever you do will come back to you". I have found that to be true. Your father was a very wise man. I had a cat named Miss Kitty that was not very original either! When my children were younger I used to raise a huge garden every year and loved it. Being from Kentucky, we love the races and good horses. Good luck on your pick. Great blog entry. Hi Des , I can say Lilly is a chop of the block. I enjoyed your post immensely. My Dad used to say so many things I wish I'd written them down. Hope you pick a winner today. Lilly, your dad is so cool. My parents really never gave me any advise or at least nothing that I remember. The closest thing I guess is when I told my mom I was gay. She didn't say anything so I asked her what she was thinking. She said, "I'd rather you were with a woman but your my son. I love you regardless." That was the best thing she ever said to me. Great advice your father had Des. Isn't it amazing that the best advice is always a little vague. Perhaps discovering the meaning is part of the lesson. I still say you and my father would have gotten along famously. He was a down to earth country boy who grew up on farms, and appreciated the simple things in life. He had a devilish sense of humor, and one of the liveliest grins I have ever seen. Some of his advice was. When you get bucked off, climb back on and have another go. Respect others until they give you reason not to, then have compassion, but don't take any crap. When you find an obstacle in your path and it seem so large you may never get around it, step back and look close, for there is usually a simple hidden answer that just needs a little distance to be seen. Thanks for sharing your fathers advice. Des, I believe you have created a loyal following already. This was another great post, full of very wise advice, good for anyone, especially the younger generation (if only they would put down the game controls long enough to listen to it). I agree with each of your fathers points of advice and I really like how you put them into modern context. I think you have a good future in blogging if you care to undertake it. I know I would be a big fan, as I already am of your daughter. I look forward to your next post. HI Des!! I loved your rules to live by!! Lilly's has a heck of a dad, too! Loved your pictures and your stories. Make sure you come back again! Be a sweetie and tell Lilly hi! What wonderful lessons. We should all be so wise! Another great post, Des. My parents taught me to be kind and to walk away from a fight. Great post...I really enjoy Des! My Mom always said: "just be yourself...don't be something you are not." Oh how true! It took me a long time to understand those words...but I finally understand the importance of her words. I'm dying to know how you went in the Cup sweeps. It was good that Bart Cummings won again, being an Aussie among so many visitors, but not so good that it was such a rank outsider. If you did happen to crack Viewed you'd be a happy boy. 120 people died in London because of knife wounds and they were either young men or boys who did the killing. 1700 knives were confiscated from kids but still the killing continues. It makes me wonder if you were right. Boys are attracted to danger and to tools. I think its just part of us as males. However, these days we just tell them not to go near them because they are dangerous. So of course they dont listen. Then they think knives are only useful for hurting someone else. Maybe we need to teach them to use them for other reasons. The world is always going to be filled with dangerous things but we need to educate our kids by teaching them and showing them not by telling them. Words are pretty useless when all is said and done. Your words on this really resonated with me. Teach and show not tell. My father died when I was very young, so even though I'm already fifty, I'm always learning. Some of your father's advices I have heard already but some I haven't. I enjoyed reading your post. Those advices are timeless and precious. Thanks for sharing a little more about yourself with us. This post is a good reminder to all of us to behave and how to treat everybody well. Lilly is very fortunate to have a father who's full of great insights. You should write a book. You're a great writer. I'll be first in line to buy it. Is it true that guns are banned in Australia? If so, they must have confiscated everybodys? I hope it will not happen here. There'll be a great revolt should that happens. My hubby is a big gun collector. I got a chuckle at your comment about Lilly. I hope she got her 10% discount? Loved your father's fathers wisdom...simple but effective. Can we get him to run for President????? My favorite part: Everyone needs somewhere to bury their troubles. I agree, Des: dirt is a great place for such! Hey, everybody, jump over to zany life + crazy faith today to read Pearl's (of Pearl, Why You Little...)guest post on Waiting For The Barbarians Day. Pearl's usual wit is on display. Lilly and all your friends, I do hope you think about writing a short guest post on zany life this month in our fun look at zany, bizarre holidays. Love to add you the fun! My father taught me that decent people are far and few between. When you meet a decent person, celebrate that you were lucky enough to run across them… they are out there … you just have to know one when you see one. I like reading your advice Des. got ur link from jade....nice blog. btw, i posted cooking gas saving tips in my blog. maybe you want to check it out? good day and God bless america! Thanks for your visit and comments yesterday, particularly about my Grandparents...I miss them dearly. I love your Dad's guest post...he is a wise man indeed. I'll be around a lot more if you don't mind...??? @ Kim - Lilly told me you were a wonderful artist and although I am not creative I have lots o my grandchildren's artowrk hung around our house. Some of them are very artistic so hoepfully one day they can paint as well. Thanks for your comments and telling me about your pop's garden. I find that I dont have youth as an excuse like you did but given my failing eyesight I often think I am pulling out weeds and they are actually plants. Hope you won on the Cup. I didnt, but had fun. @ Grandpa - I like that, 'Aim high and keep shooting'. It is the keep shooting that sometimes can be hard but we have to keep going. Your father is very proud of you I am sure. Lilly tells me you are a writer and edit people's work. My wife writes and has had books published but we cannot get her interested in blogging. Thank you for reading my story. @ Dawnie - well according to Lilly she says you are very wise anyway. sometimes people do miss out in terms of a stable family life and have to work harder themselves to make one of their own. It sounds like you have done that. Life is not easy thats for sure but family are the most important thing in your life. You realise that the older you get I think. all the best and thank you for leaving a comment. Wehn you do garden next rmember to leave your troubles there. It strangely works very well. @ Margaret cloud - thank you for your kind words. I agree with you. Family is the most important thing in our life and we have to take care of each other. God bless you. @ Rhonda - yes, Lilly thinks I am awsome. I am not asking her though to find out what she really thinks. She told you were very funny. Keeping laughing is a very important thing to do no matter what situation you are in. Just remember that. @ Saundra - thanks for your comment. I hope you look after your Dad too. @ Braja - I like that saying because she knew you knew what the right thing was. Its very simple and it must have stuck in your memory. I like that one a lot. @ Sylvia - thanks for reading my story. We did not have much luck at the races but it is always a good celebration nonetheless. @ Kay - well I already have another adopted daughter in England called Barbara. I hear you live in Hawaii whihc must be very nice place to live. I love the beach and water. Thanks for your kind wishes. @ Summer - you and your husband sound like sensible parents. No matter what others say, you do it your way and you will not be sorry. I hope you do find the time to start your vegetable garden because it is very rewarding and wonderful for the children to learn as well. Good luck with it and thankyou for reading. @ leslie - I hope you picked a winner. I sure did not. In fact I don't remember when I ever did. I live in Canberra too. @ Tami - Thank you for your kind words - the rules of life are pretty simple I guess when all is said and done. Look after yourself and thanks for your comment. @ Christine - I really like your mother's advice. We do have to pick ourselves up after we face setbacks and I think that is one of the most important things we can teach our children. how to handle adversity and get back up again no matter what. I hope the weather is not too cold for you in Canada. My wife and I travelled to Canada some years ago and loved it very much. I also think the Canadians are very similar to Australians. @ Rebecca - you cannot go wrong if you are nice. That is for sure. The simpler the advice we give children the better it is. Thanks for your comment. @ Pearl - Lilly has told me that you have a very clever cat so you will know what I am talking about in regards to animals. In the bush Kangaroos are very common it is true. In fact where I live now they can also get lost and end up on the highway unfortunately hitting passing traffic as they bound by. Not only is the kangaroo hurt but the car is a rightoff. The kangaroo I had as a boy later became leader of the pack and had about five wives I think. He used to bring them back to our farm and show off. Almost as funny as your cat. I will have to get Lilly to take a picture of Kangaroos which are nearby to show you. @ Alyson - well your mother had sensible advice. Be practical. It is very true and it seems we get further and further away from such good basic advice now. @ Sarah - Lilly wants me to write another story on how to start a vegetable garden so maybe you will be able to get some ideas from there. I do not do anything fancy but it seems to work and things grow which is the important thing. @ Rene - I think I am too old to write a book now but the older we get I think we reflect more on our life and what we learnt. I like the advice you wre given. Very practical and simple to remember and very sound. @ Aleta - from what Lilly tells me you have a wonderful family. That was a great story about your parents and their vegetable garden. That is what I do too. I give vegetables to my family and and neighbours and they give me and my wife things that they may have too much of. It is what we should be doing for each other and encourages neighbours to get together. Home grown vegetables taste a lot better than store bought ones that have been sitting in freezers for a long time. I really like reading your comment. It was very positive. @ Judy - sounds like you have had similar upbringing to us. I also like what goes around comes around - that is a good saying and very profound. Thank you for your comments. @ Trish - yes, Lilly probably is a chip off the old blog in lots of ways too. I do not paint as well as she does though. I hear you have twins. You must be busy. @ Preston - I think your mother gave you the best advice. She was actually showing you her love. We should love each other unconditionally it is true. And we should never judge another person for being who they are. We love them for who they are and that is what your mother's advice was. I am glad you had the support of your parents because it is hard without that. Thank you for commenting and my best regards to you. @ Eric - I like what you say about the advice being vague so we get to work out the lessons. I do believe as well I would have got along well with your Dad. You are a lucky man Eric because you also got to learn a lot from him I am sure. All his advice is truly very sound. Thank you for telling me about your father. @ Matt - thank you for your comments. Lilly told me you have been her greatest supporter on her blog from the beginning. I am too old Matt to be a blogger all the time. I just think I can do it every few weeks. I seem to have time to remember lots of things from my younger days as old people do. I have turned into an old person and do not know how it happened. I like to grow tomatoes, beetroot, lettuce, beans, peas, corn, cabbages, peppers, squash, capsicums, onions, cucumbers, zucchinis, spinach, pumpkin, potatoes, carrots, herbs, lemons, passionfruit, figs, plums, peaches and apricots, rhubarb, rock melon, watermelon and strawberries. That is a lot now I look at it but that is what I have been doing for years. They are all grown organically and it gives you a real sense of achievement to grow your own food. @ Sheila - thanks for you comments. @ Blonde Duck - thanks for your comments too. @ Gran - I like that Gran. Yes it is important to establish personal boundaries and never let anyone cross those. That is important advice. I wish every child could grow up with very healthy self esteem without wanting to harm others. If I had a pill for that I would be a billionaire I think. We will have to kep working on that one. @ Caroline - self acceptance is very important that is true and in that way we do not have to be other people but just ourselves. That was some good advice. Lilly tell me you have a very inspirational blog so I am sure you are helping lots of people who read your blog. @ Mcallen - thank you for your comments. I like to tell my stories so I am glad Lilly let me do that on her blog. @ Dwayne - I think that not exposing your kids to dangerous tools, when they exist in everyday life is wrong. We just have to show them how useful they are or dangerous they are. Pocketknives are very good tools there is no question and can be used for so many things. Thank you for your comments. I appreciate them very much. @ June - No, June I did not win on the Cup but I do not remember if I ever have. This year we all went out. I go out in my wheel chair and so its easy for me I do not have to get up. It was wonderful and just full of fun. I like the way you picked the horses. That was probably the best way to do it. It was good that Bart Cummings won given all the international talent. Bart is just a little younger than me but a whole lot richer I think. @ Stefan - that is some very scary statistics there. My grandchildren live in London too. Sometimes we have to accept that people will misuse tools like knives. We need to give these young people somethingn more to do with their time perhaps and teach them better things to do with knives. It is not easy but there is a reason that they are acting like this. Thanks for your comments. @ Tasha - Lilly has told me all about you and that you are writing a novel. Well done. I hope it goes well. Lilly found this information for me off the internet. 'Australians (5.2%) legally own and use firearms for hunting, the control of feral animals, and target shooting. Low levels of violent crime through much of the 20th century kept levels of Government concern about firearms low. However, in the last two decades, following several mass killings and rising concern, Australian State Governments have, with Federal Government co-ordination, enacted more restrictive firearms legislation'. So we can still ahve guns but everyone has to be licensed. I think it has only resulted in further crime really. Thank you for your comments they were very interesting. I think though that I will leave the book writing to you. @ Nikkicrumpet - its looks like you have your President now which is good news for you all. @ Jlo - thanks for your comments. Dirt has always been a good place to bury my troubles. It does you a power of good, it's true. @ Kerrie - Lilly read me your story on your grandparents. It was very, very good. I bet you miss them. Lilly ... you are so blessed! great to hear that you're promoting the grandkids' art Des.. Wise, wise words. I think he's hit the nail on the head. It's important to show your children how to live well, rather than just squawking at them. I think this is more of a challenge now, that we've become such a housebound and carbound society. By the way, FABULOUS blog! Great story Des, good advice too, I enjoyed reading it.